Birding on the Boardwalk - Leonabelle Turnbull Birding Center, Port Aransas. The Leonabelle Turnbull Birding Center, located on Ross Avenue, is open year-round. Every Wednesday morning, a birding expert answers questions and helps with identification of birds and wildlife. 9 a.m. Free. (361) 749-4158; www.portaparks.com. Birding and Nature Field Trips in Midland County - Midland Naturalists schedules birding and nature field trips every Saturday morning. Call Terri Pease for details. (432) 770-4746 or (432) 694-8587. Second Saturday Birding Tours - Heard Natural Science Museum and Wildlife Sanctuary (1 Nature Place, McKinney). Tours led by experienced birders. $8. (972) 562-5566 x237; www.heardmuseum.org. Beginner’s Birdwalk - Judson Nature Trails, San Antonio (Next to Alamo Heights Swimming Pool on Viesca St.). This birdwalk is for everyone. Binoculars available. 8 a.m. Free. (210) 308-6788; Check the Web site for other trips and activities; www.saaudubon.org. SAAS Mitchell Lake Field Trip - Mitchell Lake Audubon Center, San Antonio. From Loop 410 on the south side of San Antonio, take exit #46 to Moursund Blvd. Go south .7 mile to gate on left. 8 a.m. $5 to the center. (210) 308-6788; www.saaudubon.org. Pontoon Boat Tours of Armand Bayou - Bay Area Park (8500 Bay Area Blvd, Pasa-dena). A morning or evening boat trip on a quiet, 28-foot electric-powered pontoon boat. See herons, egrets, osprey, kingfishers, cormorants, pelicans, gulls, terns and more. $15-$25. (281) 474-2551; www.abnc.org. Planetarium Shows - Brazosport Nature Center and Planetarium (400 College Dr. Clute). Brazosport Nature Center and Planetarium presents entertaining and educational shows most Tuesday evenings under the 30-foot domed ceiling of the planetarium chamber. 7 p.m. $3 for adults, $2 for students. (979) 265-3376; www.bcfas.org/planetarium. Brazosport Astronomy Club Meetings - Brazosport Nature Center and Planetarium (400 College Dr, Clute). Learn how to better use your own telescope, share your knowledge of astronomy, and hear guest speakers on a variety of astronomy topics. 7:45 p.m. (979) 265-3376; www.bcfas.org/planetarium. Year-Round Bird Watching on the Mineola Nature Trail - Nature and Birding Trail on the campus of Mineola I.S.D. Bird-watch along scenic nature trails and bluebird count along bluebird trail. Free. (903) 569-3000. Self-guided Nature Trail - Brazosport Nature Center and Planetarium (400 College Dr, Clute). Nature trail is adjacent to the center complex on Oyster Creek. Explore the native river bottomland. Trail guides are available in the planetarium lobby and in the museum. (979) 265-3376; www.bcfas.org/planetarium. Early Morning Birding - Armand Bayou Nature Center, Pasadena. An opportunity to learn about the diverse bird life of the upper Texas Coast. See calendar on Web site for specific dates and times. $4 for adults, $2 for children. (281) 474-2551; www.abnc.org. Houston Audubon Society’s Annual Birdathon. Beginning to professional level birders are invited to help Houston Audubon Society raise funds to support its mission of conservation and protection of wildlife habitat. Youth teams (8-16) encouraged - prizes abound - see Web site for more details. (713) 932-1437; www.houstonaudubon.org. Houston Audubon Society’s High Island Spring Migration Season - Houston Audubon Society’s High Island Bird Sanctuary. Spectacular internationally recognized birding hot spot with Colonial Waterbirds Rookery located in nearby Smith Oaks Sanctuary. Unique photo opportunities (blinds available by calling); more info on the Web site. $5 day pass, $25 patch (good for week). (713) 932-1639; www.houstonaudubon.org. 9th Annual Great Texas Birding Classic - Texas coast. Weeklong birding tournament for youth, adult and mixed-age teams, including a new tournament for blind and visually impaired birders to "bird by ear." Coordinated by the Gulf Coast Bird Observatory and Texas Parks and Wildlife Department, the opening event is in South Padre Island, the Awards Brunch is in Lake Jackson, and the three registration sessions are in South Padre Island, Rockport-Fulton and Lake Jackson. $51,000 in coastal habitat conservation money, as well as individual prizes, awarded to winning teams. Cost varies. (866) 482-2527; www.tpwd.state.tx.us/gtbc. Spring Garden Festival and Plant Sale - Corpus Christi Botanical Gardens and Nature Center (8545 S. Staples). Between the Orchid Auction and shopping for plumeria, hibiscus, and other luscious plants, Spring Garden and Plant Sale guests may attend free horticultural seminars, kids’ nature activities and ladybug releases and tour the scenic 180-acre Botanical Gardens and Nature Center. Plant experts, garden-related arts and crafts vendors, plus food and drink on site. 9 a.m. to 5 p.m. Free. (361) 852-2100. Spring Migration Tour - Fennessey Ranch, Refugio County. Private, 4,000-acre ranch is hosting annual birding tours guided by an experienced birder. Full day in the field with lunch on the Mission River. $48.50, $44 with TPWD pass. (361) 529-6600; www.fennesseyranch .com. Spring Birdwalk - D. Roy Harrington Beach Unit, Sea Rim State Park. Join Sea Rim staff and members of the Golden Triangle National Audubon Society to view the wide range of neotropical species at the park and the Sabine Woods during the peak of the spring migration. Public welcome. 7:30 a.m. Free. (409) 971-2559.
photography safaris and the coastal bend photography contest - Fennessey Ranch, Refugio County. Professional photographer Sean Fitzgerald will conduct a photo jam! Meet at dawn for a morning shoot of captive animals such as raccoons, rattlesnakes and opossums. After lunch and some work on your technique, go to a rookery blind to photograph ibis, herons, ducks and spoonbills. Daylight to dark. $165, $40 macro session. (361) 529-6600; www.fennesseyranch.com. Yellow Rail Walks - Anahuac NWR. Learn about yellow rail ecology and management while searching for this elusive bird on foot through salty prairie habitat. Vigorous walking through difficult terrain; interested participants should wear waterproof boots (rubber boots are best), and bring binoculars, insect repellant and drinking water. April 16, 7 a.m.; April 17, 4:30 p.m.; April 24, 7 a.m. and 5 p.m. Free. (409) 267-3337; southwest.fws.gov/refuges/texas/Anahuac. Bird Walks in Blucher Park - Blucher Park, Corpus Christi. Audubon Outdoor Club of Corpus Christi members lead walks through Blucher Park and the expansive lawns of the homes across the street from the park. Blucher Park is the site of large migrant fallouts during spring migration. 8 a.m. Free. (361) 991-9031; www.ccbirding.com. Lunch with the Birds - Russ Pitman Park (7112 Newcastle, Bellaire). Guided birding walks in Russ Pitman Park during migration seasons. Noon to 1 p.m. Free. (713) 667-6550; www.naturediscoverycenter.org. Red River Valley Birding and Nature Festival - Hagerman NWR, Pottsboro. Field trips, seminars, workshops, demonstrations, children’s activities and more highlight this first-time birding festival in North Texas. Cost varies. (888) 893-1188; www.redriverbirding.com. High Island Field Trip: Birding trip to High Island - Anahuac and Rollover Pass. Led by Fred Collins. 7 a.m. to 7 p.m. $50 per person, includes bus and entrance fees. (713) 667-6550; www.naturediscoverycenter.org. Birding by Kayak - Lost Canyon Retreat, Barksdale. Spend a day birding the upper Nueces River from kayaks. Stay at beautiful Lost Canyon and enjoy a gourmet dinner, a presentation on the history of Texas ornithology and a star party. Cost of cabin plus $15. (830) 234-3250; www.lostcanyon.org. Bird-a-Thon - Jesse Jones Park & Nature Center, Humble (20634 Kenswick Drive, Humble). Teams of birders will identify as many species of birds as they can during the event. Top 3 teams win prizes. Reservations required. (281) 446-8588. Birding in the Big Thicket Family Day - Kountze. Events begin in Kountze Middle School Cafeteria with hands-on projects. Options for participants include a bus trip to Anahuac NWR for a guided tour or a local bird walk outside the cafeteria. 8:30 a.m. to 4 p.m. for bus trip, 8:30 a.m. to 11:30 a.m. for local bird walk. $3 per adult or child for bus trip, $2 per child for local bird walk. (409) 456-8689; www.kountzecoc.org. 12th Annual Bluebird Festival - Wills Point. Arts and crafts, games and food and educational booths are set up throughout the streets of downtown. Driving tours afford festival attendees access to hundreds of bluebirds and nesting boxes lining the roads into town. (800) WPBLUBI; www.bluebirdfestival.info. Naturalist Explorers Class - Avian Avenues - Houston Arboretum and Nature Center (4501 Woodway Dr). This class is for 5- to 12-year-olds to explore the amazing migrations that many birds take across North America. 9 a.m. to Noon. $9 for members, $15 for non-members. (713) 681-8433; www.houstonarboretum.org. Earth Day - Bay Day - Cole Park, Corpus Christi. Earth Day / Bay Day is an education and outreach festival for Coastal Bend residents. A unique opportunity to learn about bays and estuaries, wetlands, native plants and animals, recycling, conservation and other environmental issues. 10 a.m. to 4 p.m. Free. (361) 882-5625; www.baysfoundation.org. Frontera Audubon and Rio Grande Master Naturalist Plant Field Trip - Harlingen Tourist Center. Experience inland salt lakes and wetlands by touring Brushline Road Wetlands and Sal del Rey. 8 a.m. (956) 364-1410. Rhaptor Rhapsody at Jesse Jones Park & Nature Center - Humble (20634 Kenswick Drive, Humble) Learn about birds of prey, their adaptations and benefits to the ecosystem. (281) 446-8588. Nature Quest 2005 - Concan. In the heart of the Texas Hill Country, the Texas River Regions offer great birding and outdoor opportunities. Excellent programs, guided field trips and great fun highlight this weekend. (800) 210-0380; www.thcrr.com. 2nd Annual Chappell Hill BirdFest - Chappell Hill Histor-ical Society Museum. The 2nd Annual Chappell Hill Bird Fest coincides with the peak of spring migration in the Central Brazos Valley. All events will either take place at or originate from the Chappell Hill Historical Society Museum. (800) 225-3695; www.chappellhillbirdfest.com. 5th Annual Texas Songbird Festival - Lago Vista. Located 35 miles northwest of Austin, this festival includes opportunities to view the golden-cheeked warbler and black-capped vireo on birding walks, as well as programs, a trade show and other events. (888) 328-LAGO; www.lagovista.org. Mitchell Lake Birdathon - Mitchell Lake Audubon Center, San Antonio. Birdathon is similar to a walkathon - participants count birds and collect pledges from sponsors. All funds raised through the Mitchell Lake Birdathon will be allocated to the center’s conservation, education, and habitat restoration programs. 6:30 a.m. Free. (210) 628-1639; www.tx.audubon.org/mitchell.htm. Spring NatureFest - Stephen F. Austin Experimental Forest, Nacogdoches. Guided tours (birds, butterflies, wildflowers, fungi and natural history), educational displays. Activities for children to celebrate International Migratory Bird Day, Earth Day, and National Trails Day. 8 a.m. to 1:30 p.m. Free. (936) 569-7981; www.srs.fs.usda.gov/wildlife/trail.htm. Dedication of Butterfly and Hummingbird Habitat Landscape and Willows Trail - Anahuac NWR. Join refuge staff and volunteers for International Migratory Bird Day as we dedicate the new Butterfly and Hummingbird Habitat Landscape and Willows Trail on Anahuac NWR. Guided bird and butterfly walks. 10 a.m. Free. (409) 267-3337; southwest.fws.gov/refuges/texas/Anahuac. Breakfast with the Birds at Jesse Jones Park & Nature Center - Humble (20634 Kenswick Drive, Humble). Birders of all experience levels can join in this fun and educational walk. Reservations required. (281) 446-8588. 7 a.m. on the Island Hiking Trail. 8 a.m. to 12 noon. Adults $10, children 12 and under $5. (409) 384-5231.
photography safaris and the coastal bend photography contest - Fennessey Ranch, Refugio County. Professional photographer Sean Fitzgerald will conduct a photo jam! Meet at dawn for a morning shoot of captive animals such as raccoons, rattlesnakes and opossums. After lunch and some work on your technique, you will go to a rookery blind to photograph ibis, herons, ducks and spoonbills. Daylight to dark. $165, $40 macro session. (361) 529-6600; www.fennesseyranch.com. Sixth Annual Dragonfly Days - Valley Nature Center, Weslaco. Learn from experts about a South Texas treasure - dragonflies. 71 species of damselflies and dragonflies (1/3 of Texas’ population) can be found in these four southernmost counties. Friday, 5 p.m. to 7 p.m.; Saturday, 7:30 a.m. to 9 p.m.; Sunday, 7:30 a.m. to 6 p.m. $5 seminars/talks, $10 field trips, $25 banquet with Dennis Paulson, $60 all-inclusive package. (956) 969-2475; www.valleynaturecenter.org. Birds and Butterflies of the Texas Hill Country - Lost Canyon Retreat, Barksdale. Join us for a weekend at beautiful Lost Canyon with Ro Wauer, National Park Service employee for 32 years and noted author. With Ro as a guide, look for the best-known birds and butterflies of the hill country, including our two endangered bird residents, and enjoy a slide presentation and gourmet dinner. Cost of cabin plus $15. (830) 234-3250; www.lostcanyon.org. Wilderness Experience Kids Camp - Corpus Christi Botanical Gardens and Nature Center (8545 S. Staples). At this Tuesday through Friday day camp, campers age 7 to 10 learn secrets of the wilderness and its ecological conservation including plant propagation, endangered species, area wildlife, native habitat, native wetlands, nature games, and more. $60 per camp session (includes take-home projects, camp T-shirts, and daily admission). (361) 852-2100.
and its ecological conservation including plant propagation, endangered species, area wildlife, native habitat, native wetlands, nature games, and more. $60 per camp session (includes take-home projects, camp T-shirts, and daily admission). (361) 852-2100. Big Bend Nature Festival - Big Bend National Park. This nature festival will highlight the natural history of the Big Bend region with birding, reptile, mammal and other events. Through a series of field trips and lectures by noted naturalists, guests will come to appreciate this unique and rugged region. Cost varies. (432) 447-2236. Davis Mountains Hummingbird Festival - Chihuahuan Desert Research Institute, Ft. Davis. Includes seminars, workshops, field trips to local birding sites and great hospitality as you look for as many as nine species of hummingbird. General birding and bird banding will also be featured. (432) 364-2499; www.cdri.org. Annual Summer Bluebird Symposium - Fort Worth Nature Center. Features Keith Kridler, who has 40 years’ experience bluebirding and is coauthor of Bluebird Monitor’s Guide, and a silent auction. 10 a.m. to 4 p.m. $10 for members, $20 for non-members (fee includes lunch). (817) 444-8581; www.texasbluebirdsociety.org. 2nd Annual Prairie Festival - Lubbock Garden & Arts Center (4215 S. University). The Prairie Festival promotes awareness of and appreciation for the importance of a prairie and its associated species, particularly black-tailed prairie dogs and burrowing owls. This day-long event will appeal to schoolchildren and adults alike with speakers on wildflower identification and prairie conservation as well as great hands-on activities for kids. 10 a.m. to 5 p.m. Free. (806) 767-3724; www.leas.bizland.com/prairiefest2.htm. Xtreme Hummingbird Xtravaganza - Gulf Coast Bird Observatory (103 W. Hwy 332, Lake Jackson). See hundreds of migrating ruby-throated hummingbirds. Learn all about bird banding and how you can help protect migratory birds and habitats. 10 a.m. to 3 p.m. $2 per adult, children free. (979) 480-0999; www.gcbo.org. Landscaping with Natives - Corpus Christi Botanical Gardens & Nature Center Visitor Center (8545 S. Staples). In this seminar, learn that you can landscape entirely in natives and be quite colorful, easy on the water bill, and the envy of your neighbors. Instructors are a Texas A&M-Kingsville Botany /Biology professor and a member of the Native Plant Society of South Texas. Please call for reservations. 10 a.m. to Noon. $6.00. (361) 852-2100. Hummingbird Hayrides - Fennessey Ranch, Refugio County. An opportunity to observe hundreds of hummingbirds feeding and resting during their migration south. Nine miles of Mission River and acres of native plants make for a spectacular birding trip. 7:30 a.m. and 4:30 .p.m. $19.45. (361) 529-6600; www.fennesseyranch.com. Lunch with the Birds (Fall Migration) - Russ Pitman Park (7112 Newcastle, Bellaire). Guided birding walks in Russ Pitman Park during migration seasons. 12 noon to 1 p.m. Free. (713) 667-6550; www.naturediscoverycenter.org. Hummer/Bird Celebration - ACISD School Complex, Rockport. Thousands of hummers descend on our area - lectures, nature vendors, Hummer-homes tours, banding, fun and info! $2 per lecture - all-day passes available. (361) 729-6445; www.Rockport-Fulton.org. Beginning Bird ID Series - Corpus Christi Botanical Gardens and Nature Center. Designed for beginning birders, 12 Monday evening classes and six fieldtrips are taught by acclaimed birder Gene Blacklock of the Coastal Bend Bays and Estuaries Program. This program has a class maximum of 16 people and fills fast. $75, $50 for members. (361) 852-2100. Celebration of Flight - Hazel Bazemore County Park, Corpus Christi. The largest concentration of migrating raptors in the U.S., one million hawks counted last fall, is cause for the celebration, held during the peak at Hazel Bazemore County Park, a HawkWatch International site. Free. 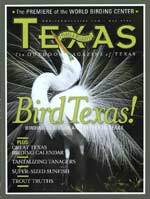 (361) 241-2617; www.ccbirding.com. Hawk Watch - Fennessey Ranch, Refugio County. The pecan trees of the Fennessey Ranch and the Mission River provide a roost for hawks along a major migration path. Be there to witness hawks take off by the thousands and see kettle after kettle soaring all day long. $48.50. (361) 529-6600; www.fennesseyranch.com. Urban Nature Series - Top Ten Birds of the Houston Arboretum and Nature Center - Houston Arboretum and Nature Center (4501 Woodway Dr). Naturalist Lucien Bouffard will share information on some of the birds which frequent the Nature Center. 2 p.m. Free. (713) 681-8433; www.Houstonarboretum.org. Texas Wildlife Expo - Texas Parks and Wildlife Headquarters, Austin. Presented by Texas Parks and Wildlife Department, Expo gives visitors an opportunity to try out and learn about a wide range of outdoor sports and pastimes. The birding area offers tours, workshops, and information about birding in Texas. (800) 792-1112; www.tpwd.state.tx.us/expo. Refuge Week - Your Favorite National Wildlife Refuge. Visit your favorite national wildlife refuge this week to learn more about your local natural heritage and what is being done to protect the wildlife around us. Bird Banding at Caddo Lake. October through April we band birds approximately two days per month. See Web site for scheduling information and past reports. (903) 665-8279; members.tripod.com/caddobirds/bird_banding.htm. Wild Walk Outdoor Adventure - McAllen Chamber of Commerce (1200 Ash). Two-day event geared toward elementary school kids where they learn firsthand about the wonderful world of nature and our environment. Plenty of hands-on activities and arts & crafts. $3 per student. (877) 622-5536; www.mcallenchamber.com. Boy Scout Merit Badge Workshop, Birds - Houston Arboretum and Nature Center (4501 Woodway Dr). Scouts can learn about the general characteristics of birds and bird identification in southeast Texas. Pre-registration required. 9 a.m. to 2:30 p.m. $20 per scout. (713) 681-8433; www.houstonarboretum.org. Lone Star Legacy - Goliad State Park. Give thanks for the memories. Join Goliad State Park in a Lone Star Legacy fundraising event. Explore Texas’ natural resources during guided nature walks, birding tours, and wildlife programs. Fee: Donations. (361) 645-3405; www.tpwd.state.tx.us. Grapevine Butterfly Festival - Grapevine. Educational programs, activities and entertainment for all ages. (817) 410-3185. Texas Butterfly Festival - Rio Grande Valley, Mission. Join us in Mission as we celebrate the Valley’s 280-plus species of butterflies. Learn from internationally renowned speakers, explore the area’s natural habitats on expert guided field trips. (800) 580-2700; www.texasbutterfly.com. Wild in Willacy Bootfest - Raymondville and Port Mansfield. Birding field trips include airboat rides into the otherwise inaccessible sloughs of the Laguna Madre Bay, boating safari across the Laguna Madre to the northern tip of South Padre Island and access to private ranches. Other events feature a children’s program, butterflies, native Texas plants and history of the area. (956) 689-3171; www.wildinwillacy.com. Annual Texas Bluebird Society Conference - Cibolo Nature Center, Boerne. Featured speaker, Bill Lindemann. Discussion of bluebird nesting season and a silent auction. 10 a.m. to 4 p.m. Free for members, $10 for non-members (does not include lunch ticket). (512) 268-5678; www.texasbluebirdsociety.org. Outdoor Nature Festival - Heard Natural Science Museum and Wildlife Sanctuary (1 Nature Place, McKinney). Outdoor festival features live animals, vendor booths, music and programs. (972) 562-5566; www.heardmuseum.org. Aunt Flora’s Nature Fest & Fall Plant Sale - Corpus Christi Botanical Gardens and Nature Center (8545 S. Staples). Between shopping for tropical foliage, exotics, landscape plants, orchids, plumeria, bromeliads, and arts & crafts, attend free nature seminars and trail tours. Aunt Flora, Cousin Fauna, plant experts, and food & drink on site. Hummer/Butterfly Going Away Festival - Texas City, Bid adieu to hummers and butterflies as they migrate through our region. www.texascitychamber.com/calendar.htm. Unveiling of Boardwalk on Wetlands Trail - Heard Natural Science Museum and Wildlife Sanctuary (1 Nature Place, McKinney). Visit the Heard Museum and enjoy the new boardwalk overlooking the Wetlands Trail. (972) 562-5566; www.heardmuseum.org. Balmorhea Birdfest - Explore private ranches and nearby Davis Mountains in search of desert, montane, water and wetland species of the Trans-Pecos region. Speakers include well-known Texas birders who are experts in the area. (231) 271-3738. 12th Annual Rio Grande Valley Birding Festival. The Rio Grande Valley’s premier birding festival featuring guided field trips, afternoon seminars, all day workshops, and keynote lectures. Meet world famous birders and see red-crowned parrots, ringed kingfishers, great kiskadees, green jays, and other birds found exclusively in this region. (800) 531-7346; www.rgvbirdfest.com. South Texas Wildlife and Birding Festival - Kingsville (1501 Hwy. 77). Exhibits, demonstrations, nature vendors, birds of prey, speakers on a variety of aspects of nature. Wildlife, birding and butterfly tours on King Ranch and in area. Many portions free, tours $20, speakers $5 to all. (800) 333-5032; www.kingsvilletexas.com. Urban Nature Series: Att-racting Birds to Your Back-yard - Houston Arboretum and Nature Center (4501 Woodway Dr). Learn how to improve backyard habitat. 2 p.m. Free. (713) 681-8433; www.houstonarboretum.org. Port Aransas Christmas Bird Count - Port Aransas/Mustang Island. Annual Audubon Christmas Bird Count. Free. (361) 749-5656. Prairie and Timbers Audubon Society Annual Christmas Bird Count - Heard Natural Science Museum and Wildlife Sanctuary (1 Nature Place, McKinney). This event is a great excuse for birders to go birding. It’s also an opportunity for less experienced and new birders to get out in the field with long-time birders and hone their birdwatching skills. $8 adults, $5 children and seniors. (972) 562-5566; www.heardmuseum.org. Buffalo Bayou Christmas Bird Count- Surveys a 15-mile- diameter area on the west side of Houston. For details, including maps, contact info, and history, please see the Web site. All day. www.houstonnaturecenter.org/cbc/txbfintro.htm. Great Outdoor Nature Series - McAllen Chamber of Commerce (1200 Ash). Series of seminars on nature-related topics. $3 per person. (877) 622-5536; www.mcallenchamber.com. Choke Canyon Birding Festival at Three Rivers -Choke Canyon State Park & Three Rivers. Guided birding tours, lectures from renowned birding experts, demonstrations, a Texas-sized BBQ dinner and networking with birders from across the country. Awards for most species sighted. $30 per person including two meals. (888) 600-3115; www.threeriverstx.org. 10th Annual Bluebird House Day - Sam Bell Maxey House SHS, Paris. Speakers will present a wide variety of information on bluebirds and other cavity nesters. Bluebird boxes and books will be available for sale. 1 p.m. to 5 p.m. $3 per adult. (903) 785-5716; www.maxeyhouse.org. Eagle Fest - Emory. Barge tours on Lake Fork to search for Bald Eagles and to view local birds and wildlife; arts and crafts show, birds of prey demonstrations, a night owl prowl, and music. (800) 561-1182; www.eaglefest.org. Brownsville International Bird Festival, Laguna Madre, thornscrub, and butterfly trips highlight this international event. Daily seminars, a marketplace, and evening activities round out the program. (800) 626-2639; www.brownsville.org. Celebration of Whooping Cranes - Civic Center and UT Marine Science Institute, Port Aransas. Annual festival celebrating the migrating whooping cranes. Trips to see the cranes at Aransas Wildlife Refuge, guided nature boat and bus trips, speakers, a nature-related trade show and workshops in birding, photography and watercolor. (800) 45COAST. Lunch with the Birds - Russ Pitman Park (7112 Newcastle, Bellaire). Guided birding walks during migration seasons. Noon to 1 p.m. Free. (713) 667-6550; www.naturediscoverycenter.org. Texas Tropics Nature Festival - McAllen (1200 Ash). Field trips, seminars, trade show and BBQ dinner. Pre-festival Mexico birding trip available and a nature festival in Monterrey, Mexico, will follow. Fees vary. (877) 622-5536; www.mcallenchamber.com.